Dino Cazares is a busy man. 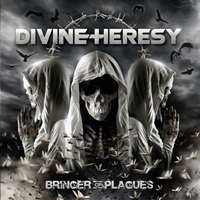 Regardless of the Fear Factory reunion he found time to record a new Divine Heresy album. 'Bringer of Plagues' is the perfect follow-up of 'Bleed the Fifth'. If you liked that album you can buy this one with your eyes closed. Like on the first album the music is of course related to Fear Factory, but it is even more extreme. It is even heavier and tighter than we are used to from FF. "Facebreaker" starts with very fast tight drumming and tight aggressive mathematic guitar riffs, clean and aggressive vocals vary each other, Travis Neal controls both parts very well. Drummer Tim "The Missile" Yeung is known as one of the fastest drummers in the genre and has participated as session or studio drummer for bands as Hate Eternal, All that Remains, Vital Remains, Nile and Decrepit Birth. Smoke must be coming out of his feet when he is drumming, what a speed! Dino Cazares of course needs no further introduction and his guitar riffs are as tight as always. If you like Fear Factory or the combination of very tight mathematical death metal with metal core influences you know what to do!